Today’s Throwback Thursdays is Seeker from HS Triumphant and is the second best card of 2010. This Supporter makes both players put a benched Pokémon and all cards attached to it to their hand. You have to make the decision first, which may be a bit of a disadvantage since your opponent may respond differently depending on the Pokémon you sent back first. I used to play Seeker back then, and this is what I experienced. Seeker is the embodiment of multiple roles: being a reliable bounce card that’s marginally better than AZ, Acerola, and Cassius combined (others have a built-in requirement and/or undesirable drawback), or being a disruptive card (not so much) to make your opponent put a Pokémon away from play for a while. At least that’s what I try to make those roles happen. So what can Seeker do for both players? They can return a damaged Pokémon to their hand for prize denial; they can bounce Pokémon with coming-into-play abilities like Uxie/Shaymin-EX and/or Tapu Lele-GX so that they can use these abilities again. This may hold true for Pokémon of any stage due to having Broken Time Space which can insta-evolve until they reach their final stage. This Throwback Thursday, we look at Seeker (HS: Triumphant 88/102). If you’re confused as to what a “Supporter-Supporter” is, I don’t blame you; it is one of the many examples of “good idea, poor execution” that accumulate as a TCG ages. The short version is that cards released during the Gen IV era (Diamond & Pearl, Platinum series, HeartGold/SoulSilver series, and Call of Legends) split the Supporter and Stadium cards off from the other Trainer cards, so that the three core TCG card classes (Pokémon, Trainers, Energy) became the five core TCG classes (Pokémon, Trainers, Stadiums, Supporters, Energy). As you know, things went back to the original three classes, with Trainers now having three major divisions: Items, Stadiums, and Supporters. All Stadium-Stadium and Supporter-Supporter cards released during Gen IV have been reclassified as Trainer-Stadium and Trainer-Supporter cards. Cards that reference “Trainers” during this period are where things get confusing; read them as if they said “Items”, as cards that actually work on all Trainer cards will actually say something like “Trainer, Stadium, and Supporter cards”. Seeker can make use of general Trainer support, but what is available in the Legacy Format doesn’t do it much good; using Skyla for a Supporter is sometimes necessary, but rarely desirable. While there are other cards in the Legacy Format that say they affect all Trainer cards, either they actually mean Item cards or they just aren’t that good. Being a Supporter means competing with other Supporters for both deck space and your once-per-turn Supporter usage, and also lets you fetch Seeker from your deck with Jirachi-EX. Again, there are other Legacy Format cards with Supporter specific effects, but none worth naming. Once played, the effect of Seeker requires both players return a Pokémon from that player’s Bench to his or her hand, including all cards attached to that Pokémon. 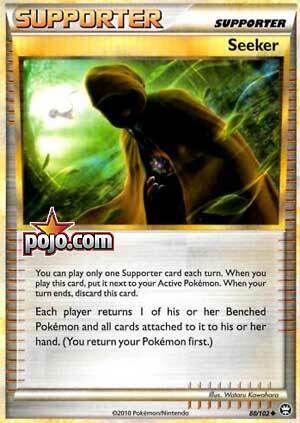 At least one player must have a Benched Pokémon in order to use this card and the player that played Seeker is the first to return a Pokémon to hand. The bounce provided by this card allows you to effectively heal a Pokémon, redistribute already used resources (from the attached cards), reuse coming-into-play effects, reuse once-per-turn effects (may require additional help), reset effects on your Active (requires Benching, replaying, then promoting it), and can allow you to manipulate your own always-on Pokémon effects. Your opponent, unfortunately, also may gain these benefits, which would make Seeker seem like an inferior bounce option. It is quite the opposite, however, and I will explain why; you control when your copy of Seeker is played, and your opponent has no choice but to return a Benched Pokémon to hand if you use it (unless he or she has no Bench). This can be used to bounce an opponent’s only Benched Pokémon to hand, which leads to a win if you then KO his or her Active, as it leaves your opponent with no Pokémon in play (a “Bench Out”). It can sometimes even break certain locks if your opponent doesn’t have any “spare” Benched Pokémon. What may have been intended as a balancing agent often makes Seeker stronger… and actually has broken it at times. During one of the periods when the player going first was allowed to attack, we had an “emergency” rotation because a deck known as “Sabledonk” began to dominate Standard Format play… and would often win if that player went first. I won’t go into the full details here, but Seeker was a part of that, reusing some of the coming-into-play effects the deck needed to spam while also increasing the likelihood your opponent had no Bench and thus could be donked. This probably hasn’t vanished from the Pokémon TCG entirely. I haven’t bothered with the Unlimited Format in about a decade, and a large part of that is because of some crazy combos enabled – in part – by Seeker. I’ll only focus on the highlights, but you’ve got Broken Time-Space, a Stadium that allows a player (during his or her turn) to ignore the usual once-per-turn restriction on Evolving a Pokémon; in other words, Forest of Giant Plants but working for Pokémon of any Type. Porygon2 (DP: Great Encounters 49/106) has the Poké-Power (a precursor to Abilities) “Download” which allows you, once per turn, to discard a Supporter from hand and use its effect as the effect of this Ability. You also needed the ample draw, search, and recycling effects of the Unlimited Format (Computer Search, Erika, Item Finder, Professor Oak, etc. ), but with them, you could bounce an opponent’s entire Bench, regardless of the size. Now throw in something that can attack on the very first turn of the game and various effects to boost the damage and/or place damage counters on the opponent’s Active, and you have some vicious donk decks that would be far less likely without Seeker. Even without this craziness, a lot of its other uses are taken to the nth degree by the excesses of the Unlimited Format, unless I missed a dramatic change in my time away. With all of that out of the way, we now come to its contemporary usage in the Legacy Format. In one sense, it’s more of the above… but at a sane level. Evolutions will need a spare set of their lower Stages to immediately return to the field. You have to catch your opponent when he or she only has one Pokémon on the Bench to win via Bench out, and donking is almost impossible, requiring your opponent starts with a 30 HP Basic in the Active position, or one on the Bench that you can somehow force Active before using Seeker. Even then, you’ve got to get Hypnotoxic Laser and Virbank City, and remember, you just used your Supporter on VS Seeker and this format has no Uxie (DP: Legends Awakened 43/146) or Shaymin-EX (XY: Roaring Skies 77/108, 106/108). If your opponent already has a shakey lock, such as having only Vileplume (HS: Undaunted 24/90) on the Bench, you can break it. For the player using Vileplume, it combos with a Gloom ready to Evolve to make the Item lock one-sided for the rest of your turn. Getting something fragile like Jirachi-EX off your Bench can also be a lifesaver, and many decks have coming-into-play effects. If Seeker were reintroduced to the Standard Format it… wouldn’t actually be amazing. Good, but not amazing. While we do have Pokémon like Pheromosa-GX and Latios-EX (XY: Roaring Skies 58/108, 101/108; SM: Black Star Promos XY72), capable of attacking the first turn of the game, we don’t have enough of what goes with it to make this as effective or vicious a strategy as in the Unlimited Format. It would help such decks, but only a little, and would probably be more important to other combo decks. Seeker would have competition from Acerola and Super Scoop Up, as well, though I think they would each have their own niche with an area of common ground where they competed or cooperated, depending upon the specific deck. Seeker would be more formidable in the Expanded Format, but again, nowhere near its past performance in Sabledonk or its (maybe?) current performance in the Unlimited Format. Not that any of us are likely to experience it, but Seeker seems like a good pull for the Limited Format; your deck isn’t likely to be swollen with Supporter cards, so that “cost” isn’t an issue. Neither player is likely to have what is needed for a combo, so this is mostly about having it at the right time when its pseudo-healing helps you, or you catch your opponent in a vulnerable state. Across the formats where it is legal, or in modern formats if it were surprisingly reprinted, Seeker has decent to good general usage, with deck specific usage bolstering its scores from a little to a lot. Yes, I am risking an Unlimited Format score for this card; anyone with contemporary, competitive Unlimited experience that wants to explain how I am wrong or – dare I dream – let us know that I’m right, feel free to contact us about future CotDs; even if you only wish to chime in on Throwback Thursdays, we’d like to have you. Seeker was rated the second best card released in 2010. I actually participated back then, but I can’t find a copy of my individual list, and I’m pretty sure this was before I was in charge of tallying the votes, so no background information from that.